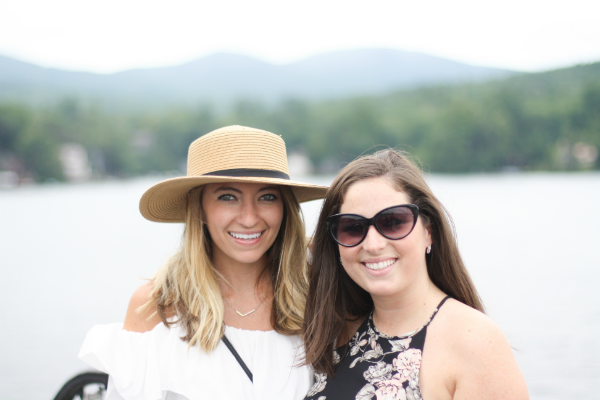 If you follow along on instagram you probably saw that I took a mini trip up to New Hampshire to visit one of my dear friends, Katie. We've been planning a get together for months, but with both of our crazy schedules it was hard to find a time that worked well for us. After weeks of back and forth, we finally agreed on a date. I could hardly wait to take a trip up the New England coast. It reminds me so much of my childhood, when my family used to road trip to Maine every summer. So many good memories up North! We spent the first day walking through the quaint town of Portsmouth and indulging in yummy lobsters rolls (more to share on that experience later this week). The second day we woke up really early and took a ski lift to the top of Gunstock Mountain. 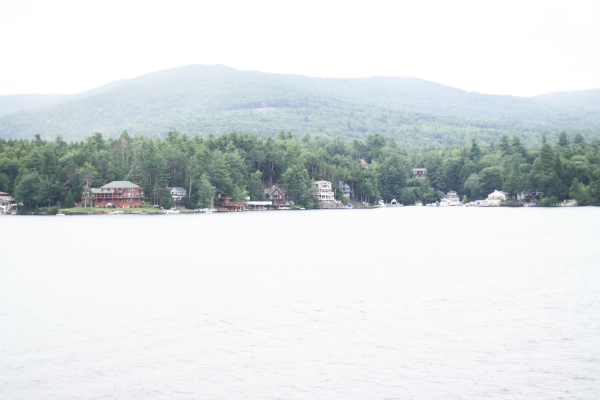 It was super windy up top and a little chilly, but the views of Lake Winnipesaukee were incredible. You can see the full view on my instagram. 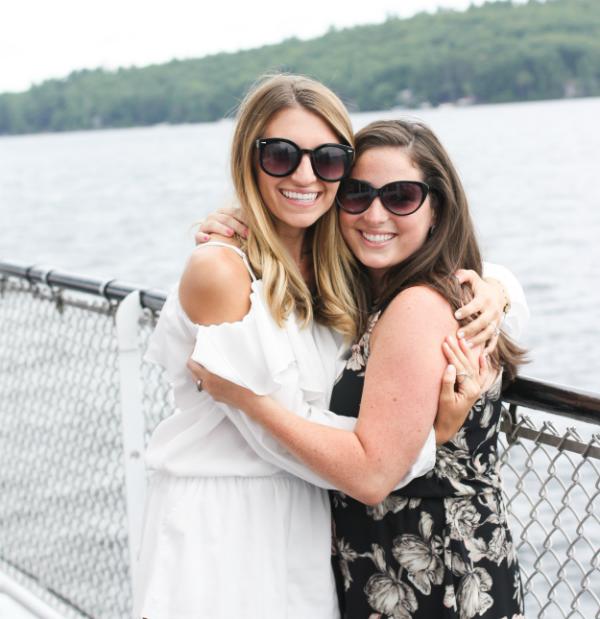 Afterwards, we took a long boat cruise around Lake Winnie and enjoyed brunch and unlimited mimosas- talk about the ultimate sunday funday. My trip wouldn't have been complete without finding a bottle of real New Hampshire maple syrup. We stopped into Meredith on our way home to pick it up. The town was filled with adorable hotels and lush gardens that overlooked the lake. We didn't want to leave, hence the picture of us relaxing on the big comfy white chairs. Part 2 of our adventures to follow later this week! 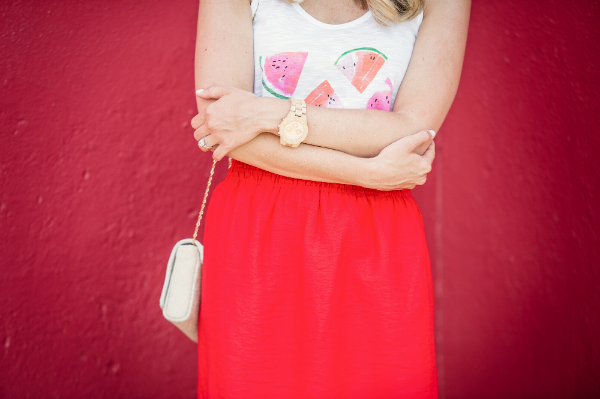 If there's one style that I gravitate towards in the summer it's printed dresses. I'm a firm believer in the come-as-you-are style...aka wear whatever your little heart desires and do so with confidence. 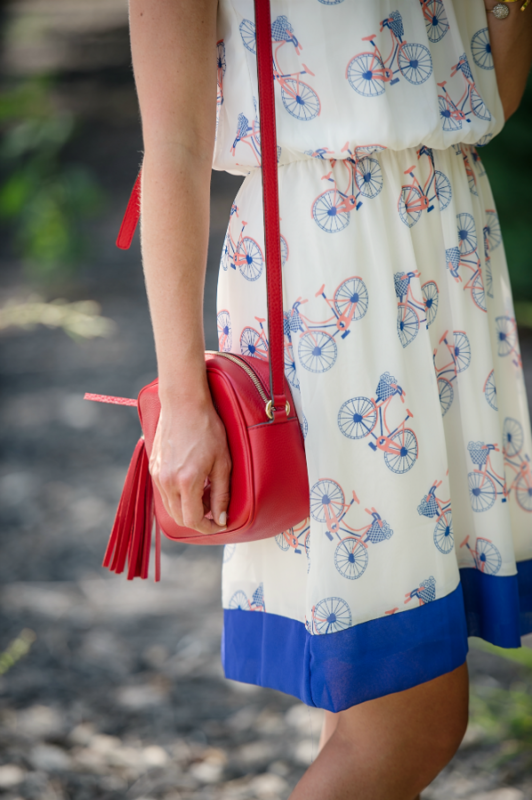 When I first laid eyes on this bicycle-printed dress I told the gals over at Pink Slate Boutique that I needed to have it. Yes need, not want. 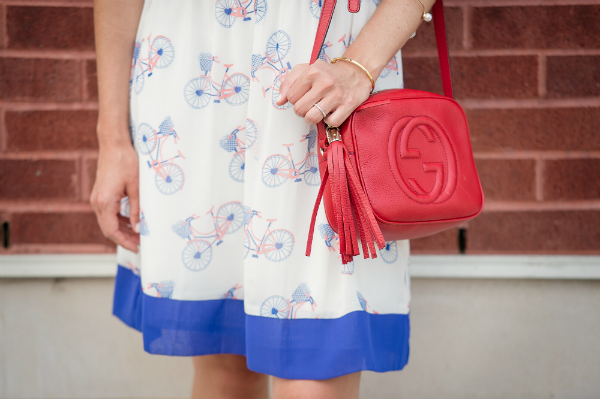 It's just so preppy and adorable! Little printed dresses (LPDs) are so versatile. You can wear them to the office, out for cocktails, on the weekends with friends, and even to more formal occasions, like wedding events. I consider these style dresses one-and-done. Just choose your accessories and head for the door. Hope this post inspires you to rotate some unusual prints into your wardrobe this season. 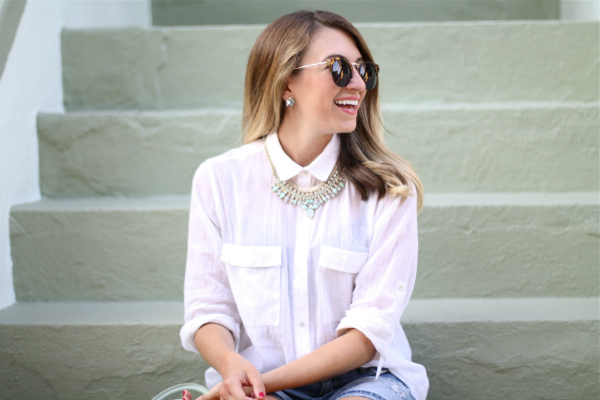 It's no secret that the white button-down is a classic essential for any wardrobe. 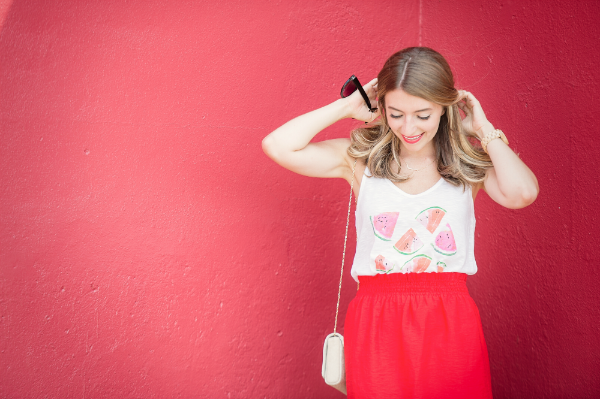 As trends come and go, it's important to have some key staples in your closet. 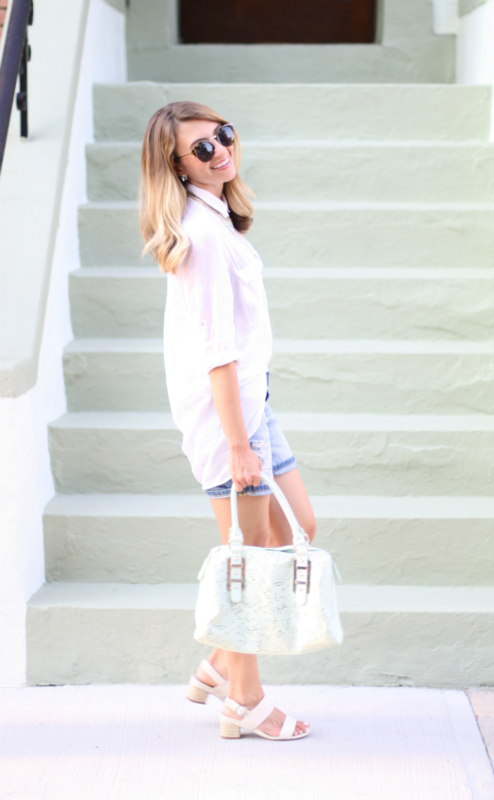 I treat my white button-downs as a blank slate and dress them up and down accordingly. I've actually had this specific top for a few seasons and have never worn it the same way twice. 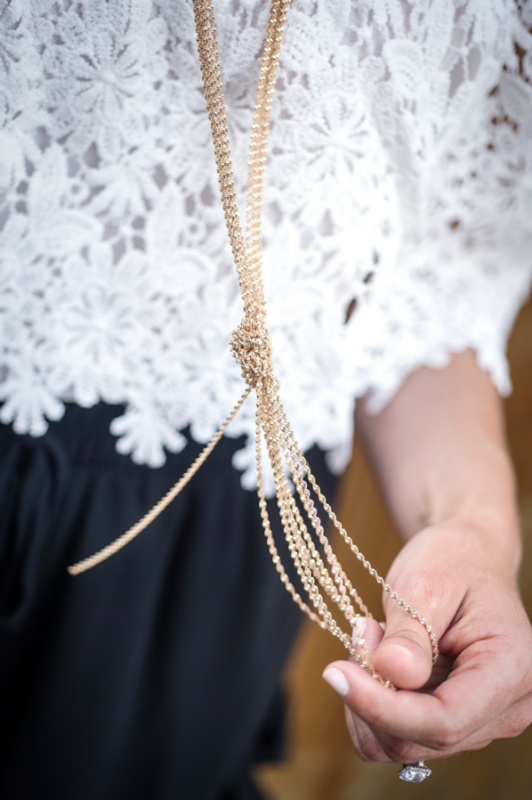 Whether it's tucked into my favorite pair of jeans, knotted and tied over a skirt, or layered with vests and accessories, the versatility is clearly never ending. 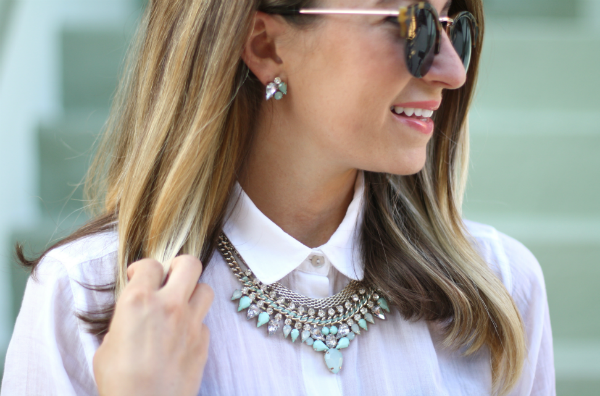 Considering it's still summer and pastel colors are acceptable, I decided to create a mint-inspired outfit focused around this super glam statement necklace. I happened to stumble upon this cute doorstep when strolling through Hoboken last weekend with Rob before dinner. Don't you think it really makes the outfit pop? Side note, I'm a sucker for brightly painted doorsteps. This one almost makes me feel like I've been swept away to Greece. Girl can dream. Hope you are gearing up for a fun weekend. I'll be visiting Boston & New Hampshire to spend some quality time with my best friend, Katie. I can't wait to see her, it's been months! Off-the-shoulder tops showcase just the right amount of skin. The look is not too revealing, yet still conveys an overall romantic feeling. You can tuck the top into a high-waisted skirt or even pair it with distressed skinny jeans and pumps. The styling options are endless! 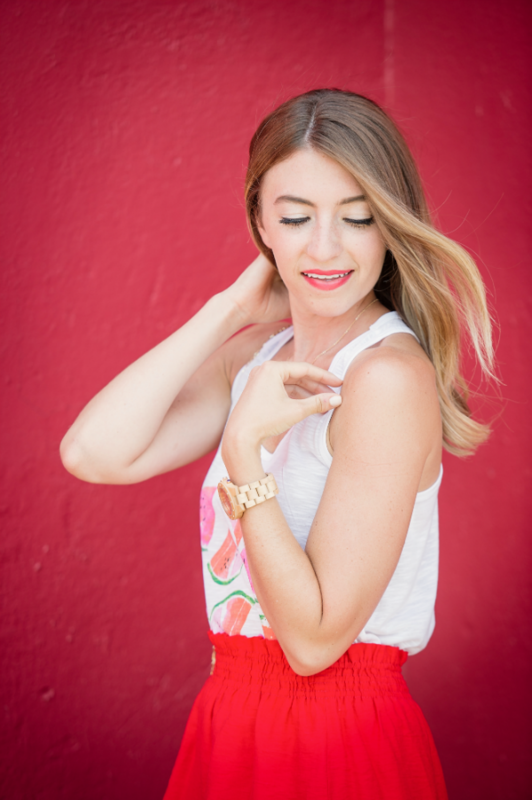 I do have to admit that off-the-shoulder tops are a slight obsession of mine. 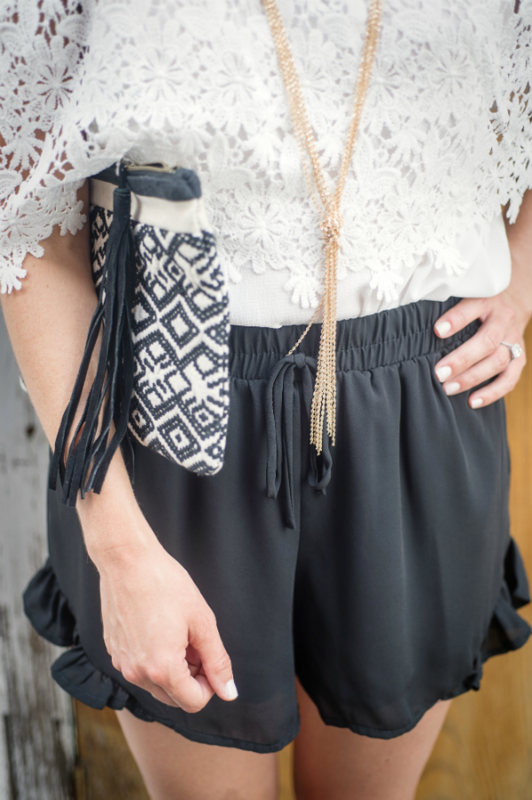 I love how comfortable and effortless they are when styled with shorts and strappy sandals. To ensure you don't lose your waistline try tucking the top into your bottoms. This will help define your waist and create a more structured flow. I wore this lacey off-the-shoulder top out for a date night a few weekends ago and received so many compliments on it. I love when I get the opportunity to tell folks that it's from Pink Slate Boutique, a favorite online boutique of mine. If you are looking for more unique shoulder-baring outfits, check out this black and white off-the-shoulder dress. 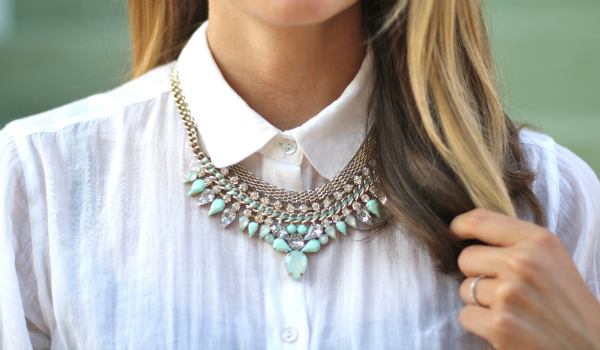 It's under $40 and would also make for a killer fall transitional piece with ankle booties. 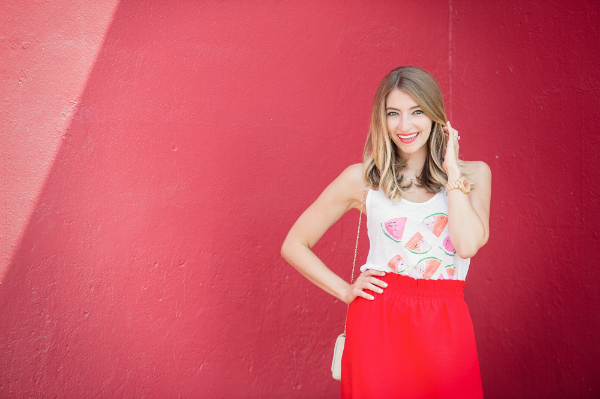 Is there anything more adorable than a printed summer tee? I think not. 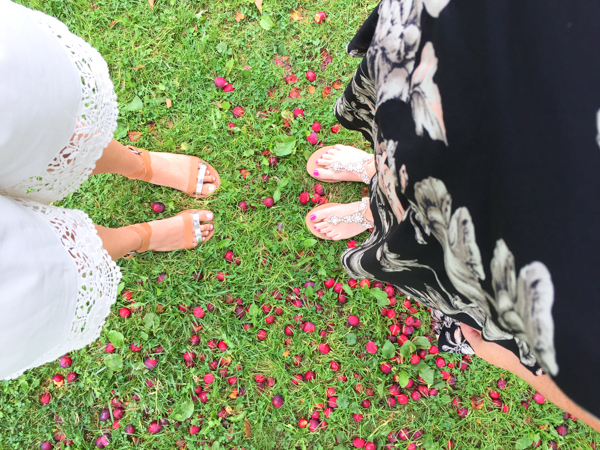 We live in a world full of floral prints, which I don't hate, but there's always room to try something new. 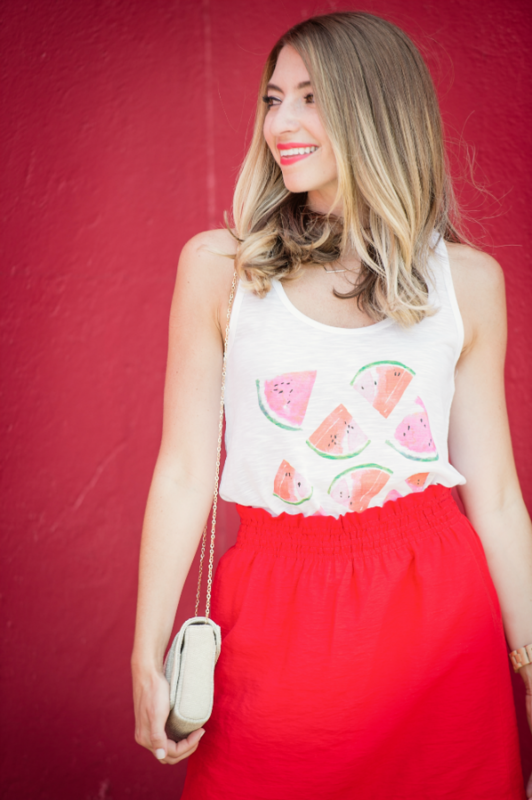 I found this watermelon tee to be so refreshing for this time of year. 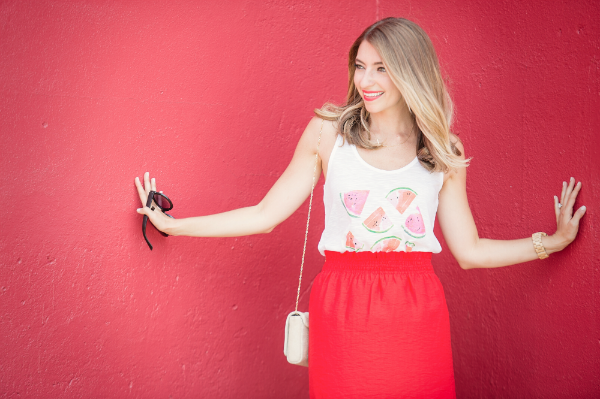 Warmer weather demands we do more with less, so keep your outfits light and cool with billowy tanks and flared skirts. With such a colorful foundation, your accessories can remain simple. You'll be thankful when the humidity rolls in. Another way to rejuvenate your weekly summer wardrobe rotation is to step up your shoe game with a pair that adds interesting dimension. The joella wrap sandals featured above is a recent favorite of mine and they are on sale right now for under $50! Check them out here. Happy shopping!